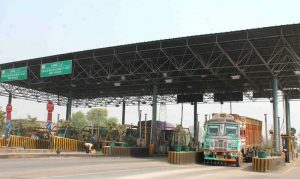 The government on Wednesday ordered exemption of toll tax on 365 toll plazas at National Highways across the country. To avoid long queues at toll plazas Pan India, the government asked them to accept the old Rs 500 and Rs 1,000 currency notes till November 11 midnight. The Centre has now extended suspension of toll tax on National Highways till November 14, 2016 midnight, Road Transport and Highways Minister Nitin Gadkari said in New Delhi on Friday. “To ensure smooth traffic movement across all National Highways, the toll suspension has been extended till 14 November midnight,” Mr. Gadkari tweeted. “We have issued instructions to all 365 toll plazas across the country to immediately accept currency denominations of Rs 500 and Rs 1000 to ease the situation of jams and long queues at toll booths,” Chandra told PTI. Chandra said he contacted the PMO as well as the Finance Ministry to apprise them of the condition at the plazas after being inundated by calls from commuters as well as state government officials over traffic congestion. “Several Chief Secretaries including Chief Secretaries of Haryana and Gujarat besides commuters contacted us about the situation. Many travelers narrated their plights,” he said. On being apprised of the situation, the government allowed toll plazas to accept Rs 500 and Rs 1,000 denominations. “NHAI has issued instructions to all concessionaires and developers including people managing toll plazas to abide by the instructions to ensure that travelers do not face any problems due to traffic hazards,” he said. The Rs 500 and Rs 1,000 denomination notes are legally accepted tenders at plazas till November 11 midnight, he explained. “Meanwhile we are strictly monitoring the situation and keeping a close eye so that commuters can travel without any inconveniences,” Chandra said. Prime Minister Narendra Modi last night announced the decision to ban Rs 500 and Rs 1,000 currency notes from last midnight. Declaring a “decisive” war against black money and corruption, Modi also listed a raft of steps to assure commoners that their money is safe. In his first televised address to the nation two-and-a- half-years after assuming office, he had announced a 50-day window from November 10 to December 30 for those having these notes to deposit them in their bank and post office accounts “without any limit”. Previous story TRUCKSUVIDHA’S MOBILE APP FOR ONLINE TRANSPORTATION FACILITY!! !